On Sunday, seniors at Marjory Stoneman Douglas High School walked across the stage to accept their diplomas and become graduates of the class of 2018. 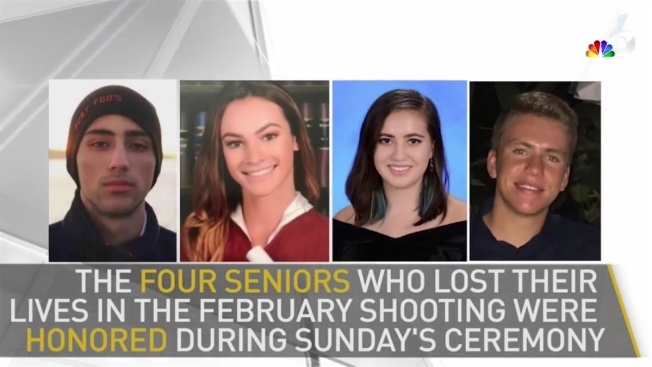 After a difficult school year due to a shooting on campus in February that left 17 dead, including four seniors, comedian Jimmy Fallon attended Sunday’s ceremony to give a commencement address. Fallon gave an uplifting message, mixed with some humor. “Today you are graduating from high school. You should be incredibly proud of yourselves. That doesn’t mean you should rest on your laurels, or your yannys,” said Fallon. Fallon also tweeted about the event, saying they should keep making a difference in the world.